During the course of 166 years, the small Helsinki-based textile service company has spread in over 20 countries. The success story of Lindström, which currently focuses in textile rental, has taken dedication, direction and perseverance. Dye master Carl August Lindström establishes a small textile dye house on the current parliamentary hill in Helsinki city center. The dye house is named C.A. Lindström & Son. Lindström sends his son on an educational trip to Europe. While travelling through Denmark to Berlin in Germany W.E. Lindström is familiarized with the Central European novelty of dry cleaning. Upon his return home he incorporates the technique into his father’s company and expands the company’s operations. The company’s owner family changes. Uusi Pesula Oy acquires Lindström’s stock in 1922, and the company has been owned by the Roiha family ever since. Lindström focused increasingly on laundry and cleaning services. The company strategy was altered again. The company gave up laundry services and once again centralized its operations in textile rental. This is when Lindström’s process of internationalization also began, partly unintentionally. ”The thought had stirred in the back of my mind”, Jukka Roiha remembers. Before taking charge of the family company, he had lived and worked in the Netherlands and Germany. 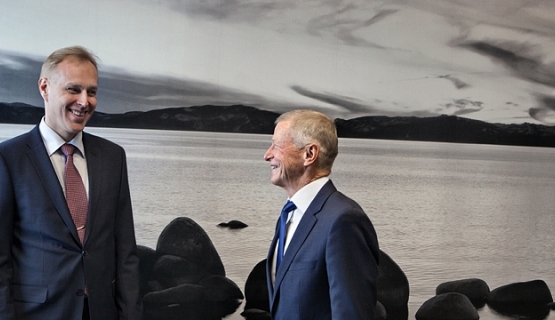 Due to the corporate acquisition of 1993, Lindström was presented with the opportunity of expanding its operations into Estonia. ”It was something that just seem to surface. At this point we laid out our first internationalization strategy. It was simply jotted on a piece paper, but looking back on it now, it has taken place surprisingly well”, Roiha says. Lindström has subsidiaries in 23 countries. 40 per cent of the company’s EUR 303.2 million revenue derives from outside Finland. Chairman Roiha ponders on the next challenge. ”Lindström’s story has taken courageous choices. Not reckless ones, but necessary ones in terms of boldly revising the company’s strategy. Even when times are good.